LOVE IS IN THE AIR and it is time to show it. 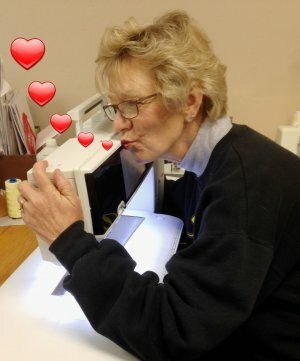 Take the time to remember those Valentine "shoe boxes" and those who you secretly wrote something special to; give your spouse an extra kiss for just being themselves; tell your children and grandchildren how much they mean to you; give your pets an extra treat; and pay it forward to your friends who do so much for you. Some of my special Valentines are Nettie, Annie, and Vi. Many of you may know that these are my sewing machines. I cannot live without John for sure, but I also cannot live without my machines. Therefore, we are hosting our "Love Your Sewing Machine Day" event this Saturday. We are honored to have Cameron McMillian, owner of A Clean Stitch (and our favorite sewing machine technician) visit our store with many of his previously loved sewing machines for sale. This is a fantastic time to look into getting a better machine or maybe a second one. In addition, we will be having all of our sewing machine accessories on sale at 20% OFF. Treat you "beloved" to some new needles, bobbins, Bendable Bright Lights, oil, needles, seam guides, and feet. Don’t forget, this Friday is our monthly Pajama Party. Great company, loads of fun, and outstanding food! 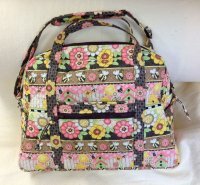 We still have some seats left for Marilyn’s Catch All Caddy and Carry-On Bag classes. Call us soon to sign up for these fun classes. The bags will come in handy during your upcoming trips. You will look marvelous with these personal creations. A special thanks to all of you who participated in our Moda Sampler Block Shuffle. I think we had as much fun as you did, just being able to see your beautiful blocks. Congratulations to Cheryl Hamilton, the winner of our Shuffle drawing. 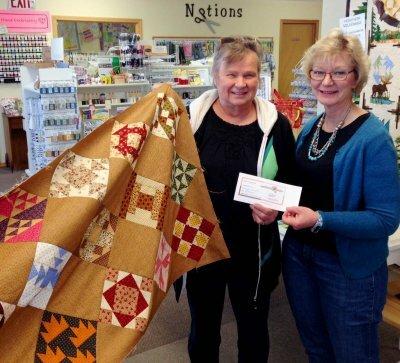 Cheryl received a $50.00 gift certificate courtesy of Patchwork Quilts. Way to go Cheryl! I also want to congratulate my Denver Broncos for a great Super Bowl game. Congratulations are also in order for the lucky winners of our 3rd Annual Super Bowl Fat Quarter Pool. Ruth Lewis, Cindy Beck, Pat Webb, and Meredith Johnson each won 25 fat quarters. Good job ladies! Our WEEKLY STEAL of a DEAL features embroidery scissors for only $2.99. As always, new items will be replaced on Sundays. Check it out on our website or stop in to Patches.